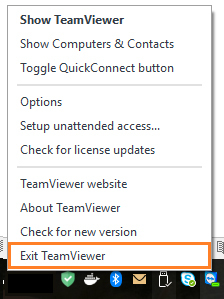 What is TeamViewer? Do I have to worry about you reading my personal information? TeamViewer is a remote support application – installing it allows us to see what you’re seeing on your PC, making troubleshooting a more efficient experience for everyone. Please be sure to close any windows, programs or documents you wouldn’t want anyone outside your organization viewing. TeamViewer says it’s already running? How can I fix this? Please check your system tray for the following Icon. My support person is talking to me through TeamViewer? How can I get them to hear me? 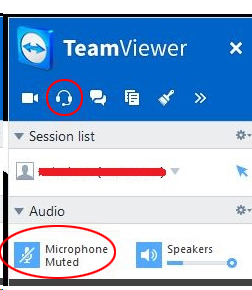 You can only use TeamViewer for voice communication if your computer has a microphone. If your computer does not have a Microphone please be sure to provide a contact number when you submit your support ticket to support@work365apps.com. To start an internet call, please click the headset icon, highlighted in red below. We will unmute our microphones to communicate with you. However, your Microphone is muted by default when the call starts, so be sure to unmute it when the call begins.